The parking lot at Daniel Lewis Middle School in Paso Robles was mostly empty on a recent cold and quiet morning, until a handyman’s truck pulled in and stopped briefly. The school was closed for winter break, and the driver wasn’t there to fix anything. A young boy got out and ran with sneakers in hand to the campus gym. Inside, upbeat music blaring on the public address system got kids in the mood to move, and more than a dozen adolescents dribbled, shot, and chased after basketballs, their shoes squeaking on the smooth gym floor. 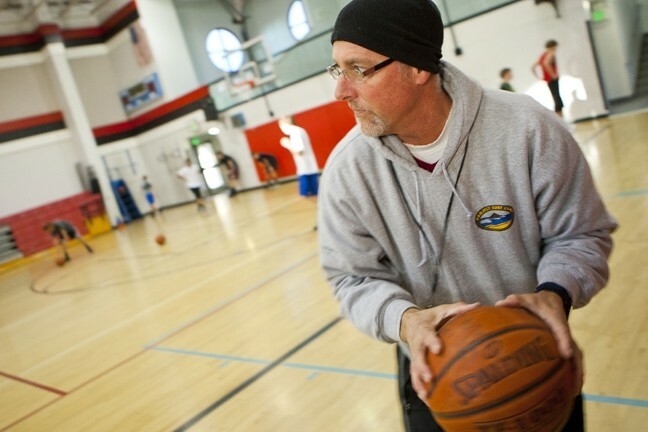 STILL COACHIN’ : In addition to teaching special education courses, Paul Bodenshot serves as the athletic director for George Flamson and Daniel Lewis middle schools in Paso Robles and coaches the Lewis Leopards eighth grade boys’ basketball team. Those extra duties once came with a stipend, but after budget cuts and the loss of a grant, he does all the athletics work for free. If the facility were closed, most of the boys would have been asleep or sitting in front of a television with a big bowl of Honey Smacks while their parents went off to work, winter break or not. And considering the Paso Robles Joint Unified School District’s budget, the gym should be closed. According to a 2011 Grand Jury report, the district’s enrollment and corresponding state funding have been in decline since 2008. By 2011, the district reported a “negative financial certification” to the San Luis Obispo County Board of Education, meaning deficit spending would be unavoidable by 2012. Still, kids fill the gyms year round to practice and compete, and coaches continue to show up, drill skills, and inspire kids to improve, despite the fact that they no longer get paid for their efforts. 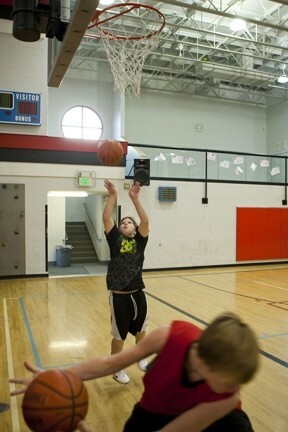 The district’s entire middle school sports program, which includes two different schools, four unique sports, and more than 20 teams divvied up by grade and gender, is run almost exclusively by volunteers. The only people getting paid for their participation are the referees, bus drivers, and janitors, but for the volunteers working directly with the kids, there’s more to be had from the experience than a paycheck. PUSHING FOR IMPROVEMENT : During the “one-minute drill,” players partner up to practice shooting and rebounding, aiming to sink as many baskets as they can in 60 seconds. Resting players tally the baskets and announce them to Coach Bodenshot, who shouts encouragement for better scores. Bodenshot teaches special education courses at Lewis Middle School, where he also coaches basketball and serves as the athletic director for all Paso Robles middle school sports. He held onto the positions even after the district stopped paying him for them, and it doesn’t seem likely that he’ll stop anytime soon. His biggest reward comes when teams from the two Paso Robles middle schools compete against each other. Then, students come to cheer for their friends while supportive parents pack the stands, sell tickets, and work the snack bar. Games wouldn’t be possible without them, and seeing so many people come together and give their time in the spirit of competition reassures Bodenshot that his volunteer hours are well spent. Knupper estimated that her coaching duties add an extra two hours to her workday. She used to get a $1,600 stipend; now she gets nothing, but she loves working with young athletes, seeing the drive in their eyes. She said athletics help motivate kids to get better grades (they can’t play if they’ve got any Fs on the report card or a grade point average less than 2.0), and team sports develop their abilities to communicate and work together. Before the budget cuts, the YMCA already offered after-school sports classes in the North County, meaning adolescents would have had some athletic opportunities even if school sports disappeared, but Knupper said that school sports add important elements of competition and team spirit that are especially beneficial to developing minds. 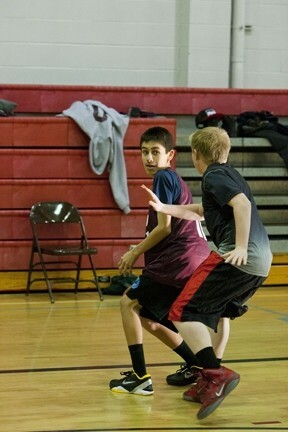 FULL PRESS : Eighth grader Arturo Resendez faces a defender during an early morning scrimmage over winter break. Dr. Jason Cohen, a local psychologist who specializes in sports therapy, echoed that sentiment. He noted that the middle school years, which cover the onset of puberty for most kids, are crucial in the formation of long-term habits. Young athletes, he said, exhibit higher degrees of life satisfaction and improved body images. Research published in the March 2012 edition of the Journal of Sports Sciences found that physically fit children outperformed their unfit counterparts in cognitive tests and even had significantly larger brain structures, especially in the basal ganglia, which allows people to choose appropriate behavioral responses to stressful situations. “People want to divide mental and physical abilities, but that’s a divide we’ve created through perception, not one that exists in reality,” Cohen said. Cohen said adolescent bodies need at least an hour of moderate to rigorous activity every day, but many kids aren’t getting that. According to the Center for Disease Control, the obesity rate among American adolescents surged from 5 percent in 1980 to 18 percent in 2008. In Cohen’s opinion, the decision makers who’ve cut district budgets and limited schools’ ability to focus on anything but the primary areas of academic achievement must be ignorant of research addressing the importance of physical activity. Any savings achieved through the elimination of sports programs will come back to bite society in the form of increased health care and law enforcement costs, Cohen said. Unfortunately, sports don’t come cheap. Rhynes said that it costs roughly $300 per kid to organize and execute a season’s worth of games. Families are asked to pay a $90 participation fee, but that leaves a $210 difference. 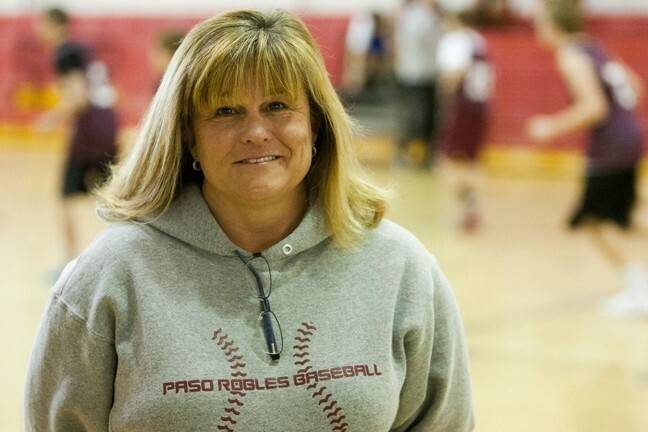 DOUGH FINDER : Even though Debbie Caruana’s sixth grade daughter doesn’t play sports, this athletics enthusiast dedicates several hours per week to spearhead the fundraising effort that’s saved middle school sports in Paso Robles. Enter Debbie Caruana, Paso’s fundraising wonder woman. Caruana first heard that the YMCA was stepping in to rescue middle school sports over Facebook, and she immediately decided to get involved, even though her children weren’t taking part in the threatened programs. Caruana’s sixth-grader wasn’t interested, but her high-school-age son had been involved in youth baseball for years, introducing Caruana to the North County athletic community. She said she couldn’t stand by and watch track and field, basketball, and volleyball disappear for adolescents. She got together with other concerned parents and teachers for a brainstorming session, and they formed a booster group dubbed “the Middle Cats,” which would work to support the Flamson Cougars and the Lewis Leopards equally. 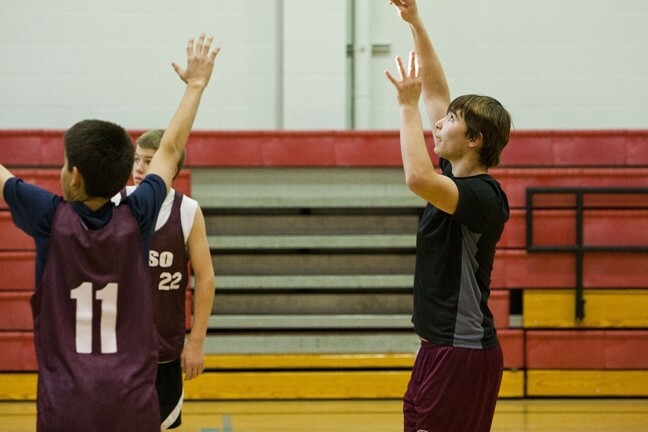 SCORING POINTS : Daniel Oliver sinks a basket in a mock game with his team mates. With Caruana leading the effort, the Middle Cats recently organized a Halloween-themed dance, open to students from both schools and held at neutral territory: the Centennial Park Ballroom. She said parents enthusiastically volunteered to help out and that there was no trouble finding support in the community. Roughly 500 students and parents participated in some way or another, Caruana said. The city let the group use the location at a discounted price (enough just to cover cleaning costs) and local businesses donated many of the supplies and refreshments. Fluid Silk Screening gave the group commemorative shirts that were sold during the dance, and Tobin James Winery donated boxes of candy for kids to buy between songs. The dance was a huge success, generating $5,000, Caruana said. Another fundraiser is scheduled for Feb. 2. This one will be a “Super Fun Run” open to everyone—kids, adults, locals, and tourists—with professionally timed 10k, 5k, and shorter kids’ runs starting from the War Memorial Stadium at Flamson Middle School at 8 a.m. Participation costs $15 to $40, and more information can be found at superfunrun.org. Caruana said fundraising has been so successful that the Middle Cats are optimistic about cutting participation fees in half in the near future, and eventually eliminating them altogether. Shelly Dargatz, the YMCA’s North County regional director, said it would be impossible to keep the school sports programs running without the generous help of volunteers and donors, and such people have been easy to find. Knowing the value sports add to young lives, teachers, parents, and students have come together and stepped up to save the programs in the face of unending state budget reductions, she said. Staff Writer Nick Powell can be reached at npowell@newtimesslo.com.